About a year ago, I observed that a young trombonist, Juan Carlos Marín, was emerging to fill a portion of the void that had been left by the passing of Juan Pablo Torres. Here is a second fellow, Eduardo Sandoval, who has also emerged as a brilliant trombonist, bandleader, arranger and composer. 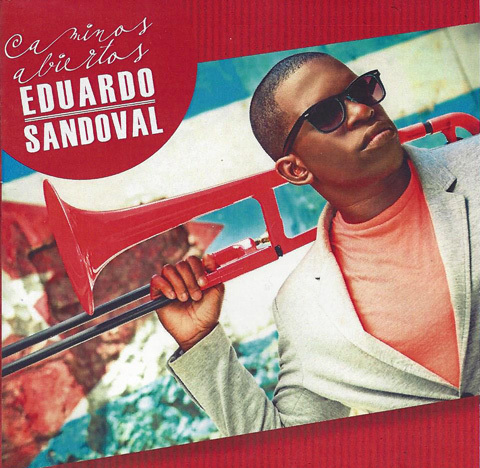 Caminos Abiertos is Eduardo Sandoval's debut album, and what a debut! Mr. Sandoval is definitely performing at the level of the late Juan Pablo Torres in those roles (this album is produced by the equally-impressive Michel Herrera, so the jury is still out regarding whether Mr. Sandoval will come to play a similar role as a producer). Most of the album is pretty straighforward (but very advanced and virtuosic) modern Cuban Jazz as opposed to some of the more Fusion-oriented sounds that are coming out of Cuba today, but you don't have to be a traditionalist to love this recording, which in addition to some of the most beautiful trombone passages recorded in Cuba and a superb band have excellent cameo appearances by saxophonist Michel Herrera, trumpeter Thommy Lowry and pianists Rolando Luna and Alejandro Falcon. This recording, along with a few others released by EGREM in the last few months, also sends a message that EGREM continues to be actively interested in top-quality Jazz.